Labor accounts for a declining share of a vehicle's cost; the Detroit 3's costs for UAW members fell to 5.7 percent last year from 11.5 percent in 2007. DETROIT (Reuters) -- The Detroit 3 and the UAW union will kick off bargaining Monday for new contracts that will set how much more robust, post-recession profits the industry shares with workers, and determine union costs to win more U.S. jobs. UAW leaders say they will insist on raises for 138,000 blue-collar workers at U.S. plants run by Ford Motor Co., General Motors and Fiat Chrysler Automobiles after rounds of bargaining in 2007 and 2011 that led to substantial concessions. Union leaders and chief executives of the Detroit 3 are scheduled to stage public handshakes next week, starting Monday with GM. Their current contracts expire Sept. 14. Union President Dennis Williams has said he wants to narrow the gap between veteran workers, who make about $28 an hour, and employees hired since 2011 with a "second tier" hourly wage of $16 to $19. 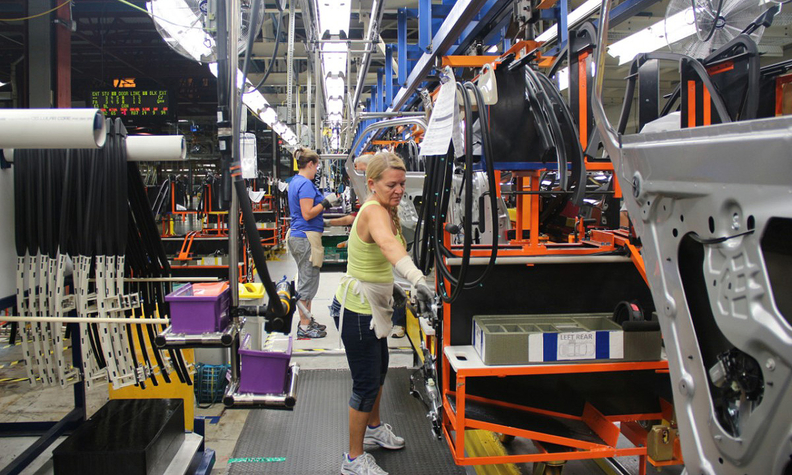 Labor accounts for a declining share of a vehicle's cost, said Sean McAlinden, chief economist at the Center for Automotive Research, noting that the three automakers' costs for UAW members fell to 5.7 percent last year from 11.5 percent in 2007. But executives at the Detroit 3 say their ability to add more UAW jobs depends on offsetting increases in wages or benefits with gains in productivity. Health care costs promise to be a central issue, as the automakers face paying a so-called "Cadillac tax" of 40 percent on rich UAW medical plans starting in 2018. John Fleming, head of Ford manufacturing, said the company expects to boost productivity by 6 to 7 percent in all its factories. "Every dollar that we don't take out is a dollar that your competitor can spend on making their vehicles more competitive," he said. The automakers' leverage is strengthened by the union's failure to organize auto plants in the southern United States operated by Asian and European manufacturers, and by the growing capability of Mexican auto workers and suppliers to build cars for the U.S. market. Ford jolted the union on Thursday by announcing plans to move production of the Focus and C-Max hybrid cars out of a factory in suburban Detroit by 2018. The company said the Wayne, Mich., factory's future would be a subject of bargaining in this round of talks.